How to Start a Blog From Scratch; First 8 Steps. I recently told you about how I’m building a blog with a more focused niche; personal finance, to see for myself if it’s true that a blog with a ‘tighter’ niche is ‘easier’ to generate traffic for, and to monetize. The goal is to get that blog to the $100k mark in earnings by January 1, 2020. I also told you that I’d keep you posted as to the blog’s progress, and what I’m doing to make that progress. Step 1: Get your domain name and hosting. After I bought the domain and the hosting (again…I’m cheap so I used this hosting company to do that, and they’ve been great despite their low cost). Because I’m a bit of a control freak, I built the blog myself. I’ve done it more than a few times, so wasn’t all that difficult. It probably took me a few days to actually decide on a theme. I’m still not sure that I’ll keep the theme that’s on it now, but time will tell. I did however, have a couple of moments of frustration while customizing the theme. This frustration is par for the course with WordPress. That said, if you know someone who can build that blog for you, DO THAT. It’s worth every dime if you can afford it. Step 2: Create an Email Address. Okay…once I built the blog and customized the theme, the first thing I did was create an email address for it. You can do this while you’re in the process of buying your domain so that you don’t forget. You’re going to need an email address for your blog immediately, so it’s the first thing you should do. If you prefer, you can create a simple Gmail address at the very beginning to minimize the work, but once your blog grows, it’s best to get a domain email address (ie: myblog@myblog.com). Step 3: Sign up for newsletter software. I started out using Mailchimp for my newsletters, because it’s free to send up to something like 2000 emails. But I’ve had Mailchimp block my emails with no explanation, with one of their suggested options being to “delete the account”, so I don’t use it anymore. No more Mailchimp for me, and I don’t advise anyone to start using it. Unless of course, you’re willing to start all over again with a new list of subscribers after Mailchimp has locked your account. I use Mailmunch for my email newsletters, because I’ve found that it’s super easy to navigate, and simple to create newsletter signup forms. It has cool templates for newsletters, auto-responders, scheduled sending, etc. and it’s only $9 US a month. Step 4: Design your newsletter sign up forms. You want to have your newsletter sign up form(s) ready, so that it’s capturing your first visitors, not starting to capture visitors after #548. I created all of the sign up forms (including the obnoxious one that drops down in your face shortly after you get here) with Mailmunch. I used Picmonkey to design the graphics that accompany the forms (more on Picmonkey below). 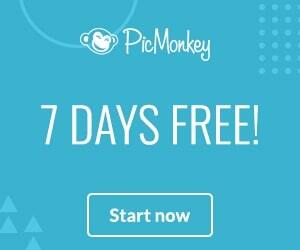 Step 5: Sign up for a Picmonkey account. I don’t care what kind of blog you’re starting, it’s going to need graphics. Graphics are the images that pepper your blog, and they make it much easier to read. Whether they’re in your posts, your sign up forms, your headings, etc. you’re going to need them…without a doubt. You could hire someone to design them for you, but as far as I’m concerned, that’s a complete waste of good dough. Especially when there are tools like Picmonkey that you can use to design awesome graphics, and sites where you can get free images for your blog. Step 6: Sign up for a Pinterest account. Once you get to Pinterest, the sign up instructions are pretty straight forward. Once you’re in, you’ll see text that says “sign up for a business account”. Click on it. Fill in all of the information. Pinterest is going to ask you to “claim your website”. This allows you to pin something called “Rich Pins” which are pins that contain more information than they would if you had a personal account. Having a Pinterest Business account gives you access to analytics tools and snap shots of how your pins are doing. Fill out your account profile, including any keywords that accurately describe your blog or business. You’d be surprised at just how many users will find you in search by your blog description. Step 7: Sign up for Google Analytics. I use two analytics tools for all of my blogs; Google Analytics (naturally) is the standard, and I think every blogger and their dog uses it. Google analytics is great, but it’s so blasted huge that it can be kind of confusing reading all the information it provides. I also use Statcounter because it’s super simple and straight forward. It’s also free (as is Google Analytics). Be careful of which analytics tools you use to track your blog traffic, because combining the wrong tools can give you false readings like a bounce rate that’s ridiculously low. I learned this the hard way. Google Analytics and Statcounter don’t ‘double up’ on visitor counts, so using both of them isn’t going to cause any issues. Step 8: Sign up for Google Adsense. As recently as a few months ago, it wasn’t all that difficult to get approved for an Adsense account. But in the last few weeks I’ve noticed that I’ve had to have new blogs actually APPROVED to show Adsense ads. Next post, we’ll talk about how to use Pinterest to get the first traffic to your new blog.